This painting has found a home and is no longer available. Artist's Statement: "There appears to be a distant full moon at the top of this painting softly illuminating the branches, leaves, and crabapples. A sliver of cloud drifts across the white disc, which reminds me of the surreal film Un Chien Andalou, which has a similar image. I feel the misty atmosphere and twilight color enhance the melancholy mood." 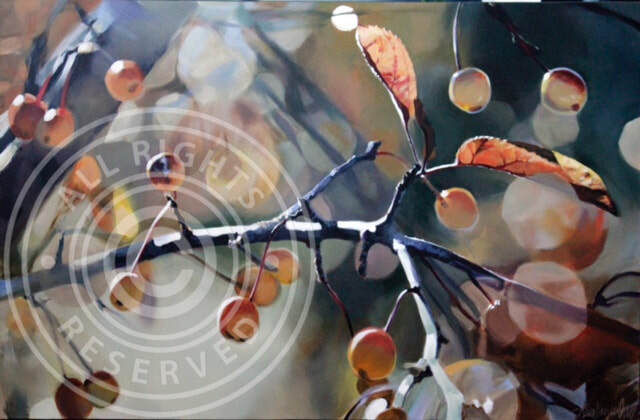 Artist's Statement: "This composition is a composite of two images with the background similar to my painting Occam's Razor, and a new image of crabapples in the foreground. Occam's Razor is the concept of the preference to use the simplest solution to solve a problem. Even though the composition is complex, the focus of the crossing branches and white shape stabilize the viewer's gaze among the many other shapes and colors." Artist's Statement: "This dark and moody painting broken by a strong beam of light is the second composition which combines two images of similar subjects superimposed one on the other. This increases the complexity of the composition and presents a mysterious appearance and environment. The dramatic high contrast between the deep background and the sharply lit fruit remind me of the qualities found in Gothic literature." Artist's Statement: "The soft, low contrast colors I used in this composition tend to flatten the space similar to the technique found in far eastern traditional woodcuts and scroll painting. 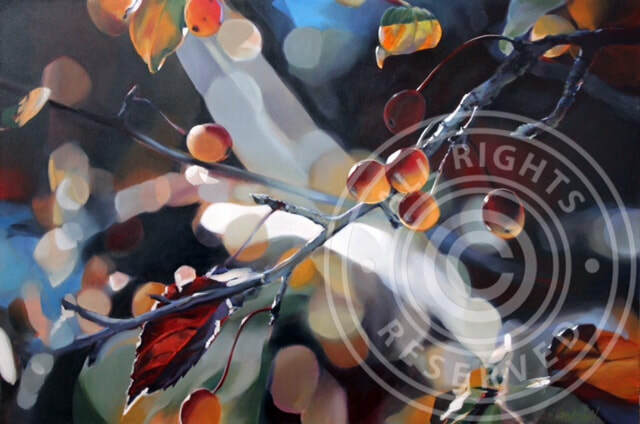 My use of a strong directional light source creates a three dimensional illusion for the crabapples in the foreground. This painting is a hybrid of different cultural aesthetics."